The European Citizen's Band Federation is an experienced organization, founded in 1976, and devoted to coordinate efforts and defend interests of CB users. It is member of ETSI and AER. EURAO Board and ECBF Council members, in their regular contacts sharing experiences and views, have realized now that formalizing their relationship could be a good idea. So they have just started working on the drafting of the future MoU that will define the relationship between both, the actions together before international bodies about: technical standards, interferences in our bands, etc. We will keep you informed of the news. 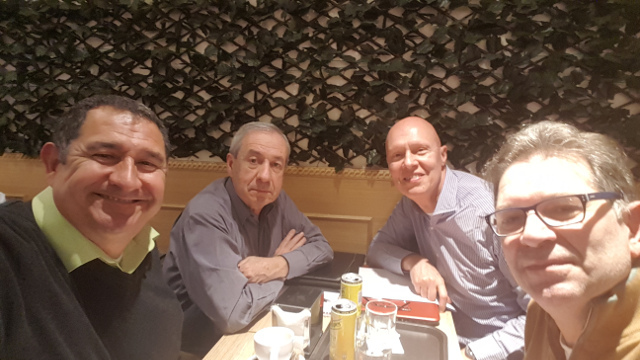 In the picture: EA4ATK (ECBF Treasurer), EA3ETV (ECBF President), EA3CIW (EURAO Secretary-General) and EB3BOL (ECBF Council member).